For the uninitiated, FBL stands for feedback loop, the mechanism ISPs like Hotmail and Yahoo! use to report spam complaints to senders. I know this will be totally shocking because, of course, your customers love you, but your messaging programs generate spam complaints if you send commercial email. And while there is a direct correlation between solid deliverability and a healthy response to complaints, I’m not going to drone on about it for another 500 words. Instead, I’m going to show you how the newly­ released feedback loops module inside 250ok’s Reputation Informant helps you overcome the historical problems preventing senders from getting the most out of FBLs. It enables you to quickly understand complaint trends, pinpoint problem spots, and take immediate corrective action. The key component of thinking about how you respond to complaints is time. Most feedback loops operate in near real-­time, meaning while there can be a delay of days or weeks between the time you send the message and when it is reported as spam, the FBL notification arrives very soon after the recipient files the report. out of that mail stream. Therefore, your responsibility is to do so, immediately. Repeatedly sending messages to recipients who have opted-­out of those messages is the fastest way to tank your reputation. You can wind up in the spam folder, or worse, be fired by your email service provider for not playing by the rules. Reputation Informant’s feedback loops module gives insight into several things. It shows your complaint reports over time, the current and historical rates at which you receive complaints, the largest sources by reporting domain, and top sources of complaints broken down by sending IP, subject line, and the sending and receiving addresses. Understand the campaigns generating the highest complaint rates. ­Identify the recipients hitting report as spam most often. ­Predict which of your IP addresses are likely to be affected and at which ISPs. You’re also able to drill down and examine the fine details of each complaint event. Most importantly, the feedback loop module makes it incredibly easy to process opt-­out for complaints by allowing you to export a list of their email addresses. It’s essentially the magic-­unicorn functionality you’ve been seeking in managing your complaints. Exporting a suppression list will help you opt-out your biggest complainers. The module’s IP and date­-based filters, along with hour­-level granularity, allow you to examine complaint activity preceding a drop in deliverability at a specific ISP. You can also explore the correlation of your heaviest complaint times with your sending patterns. Our goal at 250ok is to make every sender look great by empowering them with data and tools that simplify email. By partnering with SparkPost to bring the FBL module to every SparkPost user, we’ve made it easy to understand and effectively respond to spam complaints. Okay, true. It was also an excellent excuse to create pretty graphs and play with a lot of data. But we swear the main motivation was building great tools for our joint customers. Ahem. Paul Midgen believes that inside every ruthless revenue-driven sender lurks a recipient-centered Jedi master, and he’s dedicated to setting them free one sender at a time. 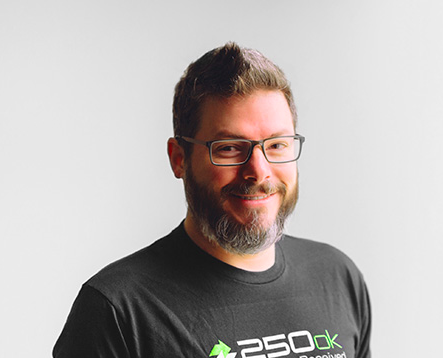 Before joining 250ok as VP of Engineering, Paul was CEO of Message Bus, ran Inbound Delivery & Anti-Spam at Hotmail, and has spent a lifetime working on things that allow machines to talk to each other for the benefit of humans.